International engagement activities at Sumac Geomatics - Sumac Geomatics Inc.
Based in the Province of Ontario, Canada, this has understandably been the core region of business for Sumac Geomatics for many years. Sumac’s expertise in data processing and setting-up onsite UAS (unmanned aerial survey) programs is increasingly recognized and has lead to not only projects outside of Canada, but also invitations to fulfill speaking engagements at International events. In addition to his responsibilities as Sumac’s Geomatics Business Development Advisor, Will Tompkinson also has responsibilities within a selection of international UAV and Geomatics -related industry communities. The months of April and May saw Will attending both Commercial UAV Expo Europe, and the GEO Business show. 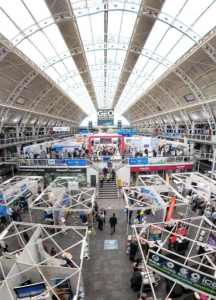 When considering the surveying and mapping community, GEO Business in London, UK is considered one of the most important events in the English-speaking European market. In an accompanying commercial seminar program, Will presented for Sumac on the implications of Sumac’s UAS monitoring services on the supply chain of its Natural Resources customers. His presentation outlined how every step of a project needs to consider what is fit-for-purpose in the collection, processing and treatment of data. These lead to examining what the enterprise financial implications could be if a team-driven driven data processing chain is not followed on these high-value stock monitoring projects, and what the unknown risks could be if relying upon completely automatic ‘black-box’ data processing systems alone. This UAV session had quite the transatlantic flavor with the opening presentation being delivered by long-time industry expert Lewis Graham of the GeoCue group in Alabama, US. A firm that has a history of being at the forefront of both lidar data processing and UAS technology solutions, Lewis illustrated how direct-referencing technology could be applied to low-cost drones to increase the efficiency of certain types of projects. 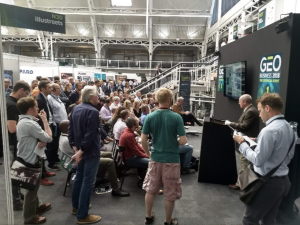 We would encourage you to follow the @GEOBusinessShow on Twitter to get a further flavor of the geomatics technologies and workflows showcased at the event. This is the European version of the Commercial UAV Expo event in Las Vegas that the Sumac team attends each year, where both Will and Adam Bozcek (Sumac Geomatics UAS Manager) have presented previously, and where Todd Domney (Sumac Geomatics Managing Director) will be presenting at the beginning of October this year. Now in its second year, it provides a very interesting perspective on differences on project approach and technology adoption on the other side of the Atlantic. For example, even though regulatory differences have meant that commercial beyond visual line of site (BVLOS) operations have been viable in some European countries for much longer than in North America; the case was described by Mantas Vaskela of Laserpas UAB from Latvia of how in powerline mapping, manned aircraft are used on smaller projects, whereas a UAS platform would be used on longer projects. It really did show how overall projects needs to be considered (e.g. mobilization rates, team costs, time required for project approval) ahead of simply the cost of the technology or flight on its own. 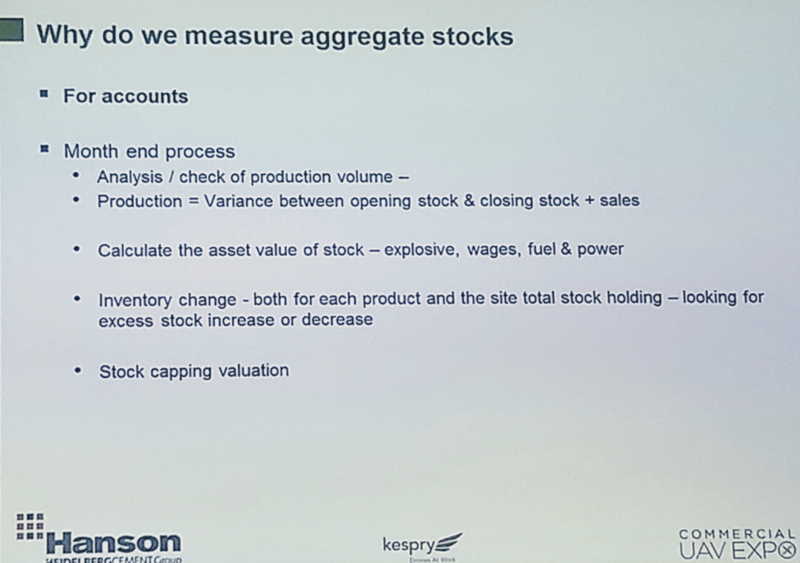 A presentation that resonated with many of the projects that Sumac undertakes was that by James Veakins of Hanson, who provided an excellent account of the business implications of using UAS reporting on their aggregates stock piles. These drivers show clearly how a UAS monitoring program reaches far beyond reducing risk, improving safety and efficient reporting. Different to many of the high-value natural resources projects that Sumac undertakes locally, the UAS data collection and processing operation is undertaken directly by Hanson (the quarry owner) using automatic methods. This falls in line with the ethos at Sumac though since it is our belief that the technology and processing systems used on a project should be fit for purpose, in the case of aggregates the relative tolerances that are reported to are many factors larger than when measuring a natural resources product such as woodchips or biomass, for example. Where the value of Sumac’s skills and experience to international clients shows itself, is in the expertise that Sumac has in setting-up and executing projects in a vast array of operational contexts. In many cases, it is appropriate for a site or asset owner to undertake their own data collection and even some processing activities; especially if they are located some distance away from a service provider’s home base. However, so much cost can be lost in a project through mistakes made in the set-up and formulation of projects, systems and their associated protocols. Already, Sumac services provide value to asset owners operating their own UAS programs through ensuring that these costs are minimized, regulations are complied with, and that the UAS program is executed in a manner that ensures that the asset owner begins ‘on the right foot’.